1. Where the term Volcano came from: The word “volcano” was derived from the Italian word “vulcano” from the Latin “vulcanus” meaning “burning mountain”. In ancient Roman mythology, the God of fire/ flames (referred to as the blacksmith of the gods) went by the name “Vulcan”, the etymology for which is still debated, but is believed to be related to the Latin words for lightning (fulgur, fulgere, fulmen). This in turn became connected to flames. It is also thought that the name ‘Vulcan’ may have been adapted from the Cretean God of nature and the nether world, “Velchanos”. In Ancient Rome, a small volcanic island in the Aeolian Islands in the Tyrrhenian Sea (off the coast of Sicily) was believed to be the forge of the god Vulcan (seen as a chimney to his workshop below) just as Mt. Etna and Olympus were, and was named “Vulcano”. The Roman name given to this island is largely what contributed to the term ‘Volcano’ becoming popular. 2. There are four major types of volcanoes, classified according to their shape, composition of their magma, and the way they erupt. They are: Composite Volcanoes (also known as Stratovolcanoes) which are the most common type of volcanoes, generally steep-sided cone shaped mountains most of which have a crater at the summit and erupt with different kinds of lava, ash, and rock . Then there are Shield Volcanoes that are wide gentle-sloping volcanoes that have low viscosity lava flows. Cinder cone volcanoes are smaller single-vent volcanoes, that have short-lived eruptions and often have bowl shaped craters at the summit. Lava domes are rounded volcanoes which erupt with very viscous lava that doesn’t flow great distances. 3. It is estimated that around 80% of the Earth’s surface, above and below sea-level, originated because of volcanic activity. The magma, molten rock, and debris from volcanic eruptions have formed some major landforms like islands, mountains, plateaus, and plains. The volcanoes didn’t just contribute to land masses, but gaseous emissions from volcanoes over hundreds of millions of years are believed to have resulted in much of the early atmosphere. 4. Although the exact number of volcanoes on Earth isn’t known, according to geologists there have been over 1,300-1,500 volcanoes that have shown some level of activity over the last 10,000 years, not counting underwater volcanoes. In more recently recorded history, there are approximately 500 volcanoes listed as active above sea-level in the world, of which 50-60 are said to erupt each year. 5. Volcanoes are mostly located along the edges of continents where tectonic plates converge or diverge. However, there is a concentration of above sea volcanoes (more than 75% of the volcanoes) in the Pacific Ocean known as the Ring of Fire. This region, extending from New Zealand, to the Philippines, Indonesia, up to Japan, the Kamchatka Peninsula, along the North American west coast and down all the way along the South-American continent, is home to 452 volcanoes. The United States has the third highest number of active volcanoes historically. Indonesia and Japan rank first and second respectively. 6. The eruption of Mount Tambora on Sumbawa island in Indonesia in 1815 is the biggest eruption recorded in history. On the Volcanic Explosivity Index-VEI (devised by Chris Newhall of the US Geological Survey, based on the amount of material released) it was ranked as “super-colossal” or a number 7 eruption, the second highest rating in the index. 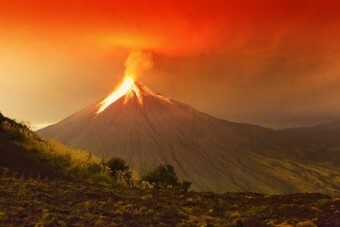 The explosion for the eruption was heard on Sumatra Island more than 1200 miles away. The destruction was vast, with an estimated ejection volume of 38 cubic miles (160 km3) and a death toll of more than 71,000 people, 11,000–12,000 of which were killed directly by the eruption. 7. The most destructive volcano in the United States (mainland) was the 1980 eruption of Mount St. Helens in Washington. Over 250 homes, 47 bridges, and 185 miles of highway were destroyed, taking the lives of over 57 people directly. The eruption produced over 540 million tons of ash covering an area of more than 22,000 square miles. The biggest eruption in the United States (and the 20th century), however, was the Novarupta (Katmai) Volcano in Alaska that erupted in 1912 with almost 3 times the volume of the Mount St. Helen’s eruption. The eruption lasted over 60 hours and spewed out an estimated 15 cubic kilometers of magma. There wasn’t as much commercial damage, though, due to the fact that the region was sparsely populated. 8. Hawaii’s Mauna Kea shield volcano is the tallest volcano in the world. In fact, if measured from the base (below sea-level), it is even taller than Mount Everest. It measures 33,500 feet (10,210 meters). 9. The most active volcano in the world (not including underwater volcanoes) is another of Hawaii’s volcanoes, Kilauea. Beginning in 1983, the Kilauea volcano has been in a state of near constant eruption, relative to most volcanoes, ever since (for 30 years). It was recorded to have erupted 45 times in the 20th century. The most recent eruption of Kilauea was in March 2011. More than 90 percent of Kilauea’s surface is made up of lava that is less than 1,100 years old. 10. Mount Etna of Italy, on the Sicilian coast, has been in an active state for over 3,500 years, making it the volcano with the most documented eruptions. Despite its periodic eruptions, the most recent of which was in January of 2011, the region houses extensive vineyards and orchards. 11. The 1991 eruption of Mount Punatubo in the Philippines was one of the largest eruptions of the 20th century (second only to the 1912 Novarupta Volcano eruption in Alaska). The aftermath of this eruption were so significant, it was said to have affected global temperatures by about 0.9 degrees Fahrenheit in the following year. The ash cloud also caused by the eruption rose over 22 miles in the air and was one of the primary contributors to the number of deaths associated with that eruption. A large number of homes also had their roofs collapse in because of the weight of the accumulated wet ash. 12. November 13, 1985 : Dubbed the ‘Armero Tragedy’, over 23,000 people in Armero, Columbia were killed by volcanic mudslides (lahars) caused by the eruption of the Nevado del Ruiz Volcano. After 69 years of being dormant, the Nevado del Ruiz volcano in Tolima, Colombia erupted causing a pyroclastic flow (a current of superheated gas and rock that moves a speed of around 450 mph (700kmph) away from the volcano) to melt the mountain’s snow cap and glaciers. This in turn sent 4 lahars (mudslides and debris flows caused by the volcanic eruption) down the mountain and into river beds that swept into the sleeping town of Armero, burying it in thick mud that had the density of concrete. Over 20,000 of the town’s 29,000 people were killed that day and another 3,000 people from the neighboring towns died as well. This was not the first lahar that Armero has seen; in 1845, a lahar swept through the town killing over 1000 people. The town itself was re- built directly on top of the 1845 mudflow deposit. Do you know any other interesting volcano facts? Please leave them in the comments below! Vesuvius is only the most dangerous because of it’s potential VEI (6) and because is surrounded by a city, hovever the Phlegreaen fields (near Vesuvius) are even worse.